Towards the end of the year 1825, two women whilst making a vain attempt to reach the Rotunda Hospital perished together with their new born babies in the snow. When this became known a number of benevolent and well-disposed persons founded “The Coombe Lying-in Hospital” in the year 1826 for the relief of poor lying-in women. Leading the Charitable Committee was a Mrs Margaret Boyle of Upper Baggot St, Dublin. Kirby was replaced as Master in 1836 by Hugh Carmichael, and the name of the hospital changed to the ‘Coombe Lying-in Hospital and Dublin Ophthalmic Dispensary’ — Carmichael had an interest in ophthalmology. In 1838, it was reported that the hospital had 42 beds and “daily affords advice and medicine to about one hundred and fifty extern patients.” The original building deteriorated and in in 1867, the patients were transferred to another hospital on Peter St run by Kirby. Benjamin Guinness and others provided funds for a new hospital which opened in 1877. 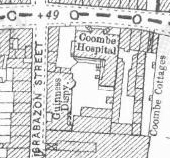 A dispensary is visible along Brabazon St on the later nineteenth century map of the area, labelled “Guinness Dispy”. A century after the original building closed, this new hospital also closed, and the new Coombe Hospital opened on Cork St. The portico is all that remains. The portico surrounding this plaque formed the entrance until the year 1967 when the hospital moved to a new location in Dolphin’s Barn. It has been retained and restored by Dublin Corporation as a memorial to the many thousands of mothers who gave birth to future citizens of Ireland in the Coombe Lying-in hospital and also to the generosity of the staff and friends of the hospital. The housing scheme which was subsequently erected on the site by Dublin Corporation was officially opened by the Right Honourable the Lord Mayor, Alderman Fergus O’Brien T. D. , on 20th November 1980. 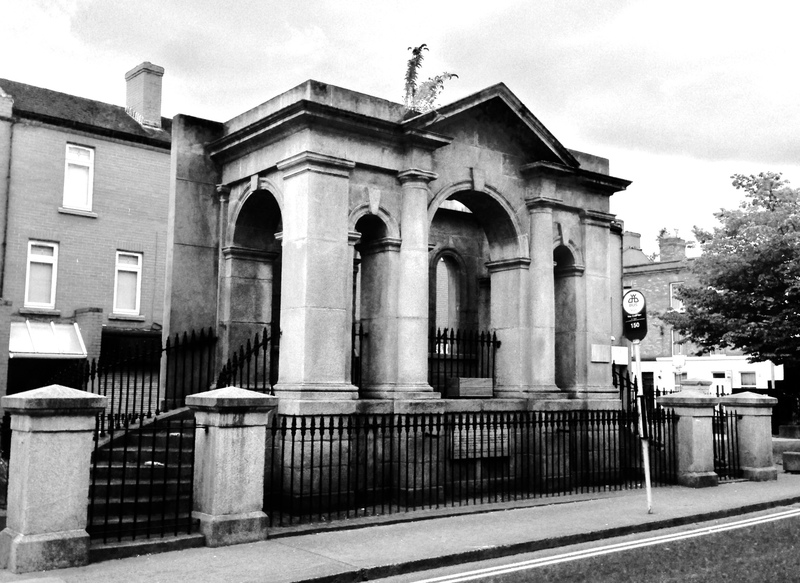 David Mitchell (1989) A Medical Corner of Dublin (1711 to 1889), Dublin Historical Record, 42(8), 86-93. L. B. Somerville-Large (1964) Dublin’s Eye Hospitals in the 19th Century, Dublin Historical Record, 20(1), 19-28. You can see a photograph of the original building at Archiseek.